Based on recent findings, there is no doubt that a digital coupon strategy will drive increased revenue and customer engagement for retailers. 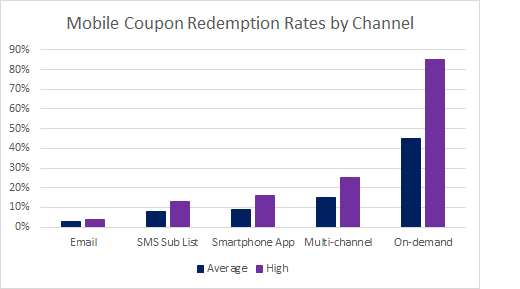 CodeBroker’s in-depth analysis of our retail customer’s mobile offer promotions and associated redemption rates show significant payback to retailers who implement a thoughtful mobile offer strategy. Specifically, CodeBroker observed that a successful digital coupon strategy is dependent on several factors. Namely, the sense of urgency the retailer creates with the promotion, the mobile coupon delivery channel used, the level of consumer engagement with the brand, and of course the value of the offer all play a role in the level of mobile engagement and ROI the retailer realizes. Mobile engagement ROI varies significantly depending on the channel the retailer uses to engage with the consumer. Mobile offers can create a sense of urgency among a retailer’s most engaged customers. Significant incremental revenue can be attributed to SMS marketing mobile promotions. Digital coupon fraud and liability are dramatically reduced through the use of mobile offers.